We offer free installation assistance for both trial and commercial licenses. You can get help via email, instant messenger or via remote access to your server. You only need a few minutes to get online help. The Admin panel provides a user-friendly web user interface to setup folders for users. Information about assigned folders is stored in the Data\Folders.xml file. You can modify this file manually with a text editor. Also you can programmatically setup users and groups. Check that Read and Modify NTFS permissions for Data\ folder are set correctly. Open "/HTCOMNET/AdminPanel.aspx" in a browser or click Administration button on the toolbar of the main interface. Open the "Folders" tab and click "Add folder..." to create a new folder, or "Edit folder..." to edit an existing one. Insert an alias for the folder in the "Folder name" field, e.g. "My personal folder" or "Students shared", etc. Note. You cannot use alias "root" for technical reasons. Insert the full path to the folder in "Physical path" field. It can be a local path (e.g. 'c:\myfolder') , remote folder on a server (UNC format like \\MyServer\filesharename\directoryname) or DFS folder (like \\domain\DFSfolder). %USERNAME% or %LOGONUSER% - the pattern will be replaced by the user's logon name. For example, if you create "c:\personalfolders\%USERNAME%" for "jdoe" user, the path will be "c:\personalfolders\jdoe" when 'jdoe' logons into the HTTP Commander. %USEREMAIL% - the pattern will be replaced by the user's email address if exist. If the email is not specified for the user, then an appropriate error message will be shown when opening such a folder. For example, if you create "c:\personalfolders\%USEREMAIL%" for "jdoe" user with email "jdoe@domain.com", the path will be "c:\personalfolders\jdoe@domain.com" when 'jdoe' logons into the HTTP Commander. %USERID% - the pattern will be replaced by the user's SID (Security Identifier) if exist, otherwise - user's name (%USERNAME%). For example, if you create "c:\personalfolders\%USERID%" for "jdoe" user with SID "S-1-2-5-123", the path will be "c:\personalfolders\S-1-2-5-123" when 'jdoe' logons into the HTTP Commander. %GROUPNAME% - the pattern will be replaced by the logon user's group name. For example, if you create "c:\%GROUPNAME%\%USERNAME%" for "Mike" user from "Students" group, the path will be "c:\Students\Mike". %USERNAME_SUBSTRN_L% - the pattern will be replaced by a substring of the user's logon name. N is start index (starting at 1; if is empty, less than 1 or more than username length - used 1), L is length of substring (if is empty, 0 or more than the remaining length of username - take a substring to the end of the username). For example, %USERNAME_SUBSTR2_2% for Mike user will be "ik"; or %USERNAME_SUBSTR2_% for John user will be "ohn". %GROUPNAME_SUBSTRN_L% - the same as above but for the group name. %HOME% - The pattern will be replaced by the user's Active Directory home folder's path. Note! For greater perfomance use %USERNAME% (or %LOGONUSER%) pattern instead of %HOME% if it is possible. Note! Don't share folders inside the application root folder (deleting some files and folders in the application folders restarts the application). Click the "Add user..." button to provide access for a single user, or "Add group..." to provide access for a group of users. In the user/group selection dialogue, enter a user/group name or select the name from the list, for example, jdoe or Students2009. When HTTP Commander is configured to use Windows accounts, we recommend that you specify a fully qualified user/group name with domain part. For example, YOURDOMAIN\Students2009 or jdoe@YOURDOMAIN. See Active Directory integration for complete list of supported account name formats. Insert "regex:" in the beginning of the line if you want to use regular expression. Example 1: regex:^(jdoe|Mike)$ - this regular expression means two users: jdoe and Mike. Example 2: regex:Students - this regular expression means all groups with "Students" in their names, e.g. "Students2008", "Students2009", etc. If you want to provide access for any user, you need to type regex:. * - this regular expression means any user name. After the users or groups are specified, you need to configure permissions to the folder for selected users and groups. There are two layers of access control that determine the set of allowed operations with the file system. NTFS permissions (provided the file system is hosted on NTFS volume) applies to a Windows security principal. HTTP Commander permissions specify what operations are allowed in the application. In most cases NTFS permissions are already set for the folders for your users and groups. There is no need to modify the existing NTFS permissions. The application impersonates the logged on user before performing operations with file system. A user won't have access to files if it is prohibited by NTFS permissions. Select a user or a group name in the list. Set necessary permissions on the right panel. The user should logoff and logon again to view new created folders. Extra parameters: You can type "Limitations" for the folder-this is text that will be shown for users at the most visible place. There is also a "Description" field - it is text that will be shown for users in the left tree. Show files ListFiles Enables showing files in the folder list. Security note. Zip and download ZipDownload Enables zip and download operation. Application zips the file or folder, then provides a link to download the resulting archive. Show folders ListFolders Enables showing folders in folder list. Security note. File list via public link AnonymousViewContent Allows the generation of a public link with restricted file system browser capabilities. The link must point to a folder. When user opens the link in a browser, the content of the folder is displayed like in the main HTTP Commander interface. User may navigate the file system within the limits of the selected link folder. Specify a filter for files that should be displayed in folder list. The filter is based on the file extension. You may either specify a list of extensions that are allowed or extensions that are prohibited. In the first case you'll see only files with the selected extensions, in the second case you'll see all files excluding files with the selected extensions. For example, allow "DOC,PDF,JPG", deny "EXE,BAT,COM". The extensions field contains a comma-separated list of extensions. Type radio buttons specify how the list of extensions will be applied: allow - list of extensions specifies allowed extensions, deny - list of extensions specified prohibited extensions. Restriction of file creation CreateRestrictions Like "Restriction of display permission" but applies to create file operation. You may specify what files a user may/cannot create based on file extension. HTTP Commander allows you to manage quotas on folders. You may query existing quotas and create new ones. Quotas are powered by File Server Resource Manager. File Server Resource Manager is available for Windows Servers 2008 R2, 2012, 2012 R2, 2016, 2019. Supported OSs: Windows Servers 2008 R2 SP1, 2012, 2012 R2, 2016, 2019. Note. A local folder is any folder located on the hard disk on the web server where HTTP Commander is installed. For example, "c:\HttpRootFolder". File Server Resource Manager is installed on the web server machine. Administrative rights to the web server machine. Note. A network folder is any folder specified with UNC paths. For example, "\\server-name\shared\dir1". Successful resolution of network path. In other words, ability to detect the server and folder hosting the data. For example, the network path "\\server-name\shared\dir1" may be resolved to folder "C:\shared" on server "server-name". HTTP Commander supports paths of conventional shared folders and DFS paths. If the network path specifies a conventional shared folder, you need administrative rights to the server hosting this folder. For the network path "\\server\share\dir1", you need administrative rights to server "server". If the network path is a DFS path, you need administrative rights to the root DFS server if this is a stand-alone DFS namespace, and to Domain controller if this is a domain-based DFS namespace. In stand-alone case, information about the DFS namespace is stored in the registry of the root server. In domain-based case, information about the DFS namespace is stored in Active Directory. After resolving the DFS path you get another network path that should be resolved. The DFS link may point to another DFS path or to a conventional shared folder. The resolution process continues until HTTP Commander finds the target server and folder hosting the data. File Server Resource Manager is installed on the target machine. The target machine is detected in the process of resolving the path. Administrative rights to the target machine. No firewalls blocking remote procedure call (RPC) ports used by DFS and the DFS root server that hosts DFS. This condition should be fulfilled for all DFS root servers and DFS hosts discovered in the course of path resolution. See DFS Namespaces overview. Note about administrative rights to remote machine. In the process of resolving the network path and for managing quotas on remote server, you are required to have administrative rights to the remote machine. If one of the machines is Windows Server 2008 R2 SP1, Windows Server 2012 (R2), 2016 or 2019, then both machines must be joined to the same domain or trusted domains. Limitations. HTTP Commander follows only first target of DFS link and DFS root. HTTP Commander allows to specify a filter to express additional restrictions on the set of users whom the specific folder is assigned. This filter applies in addition to ACL (the list of users and groups that are allowed access) and can express complex conditions. The syntax of the filter is similar to the syntax of LDAP queries. where attribute is either user or group, value - the value of the attribute. The attribute value may contain substitution characters: *, ?. Note, brackets and quotes are mandatory. Comparison is case-insensitive. To create a complex filter, individual components are composed into a filter list using logical AND (&), OR (|), NOT (!) operations. For example, (&(|(user="user*")(user="Admin"))(!(group="group1"))). This filter matches a user with the name "Admin" and users whose names begin on "user", that are not members of the "group1" group. For validate syntax of the filter entered by you, it is used the link Validate to left side of a field. If you use Group Policy Drive Maps Extension, you can import Drive Maps as HTTP Commander folders. On the Misc tab of Admin Panel you can import folders manually. You need to specify a data source — from where to load Drive Maps. You have two options: Domain Controller ("From DC" option) or XML file ("From file" option). 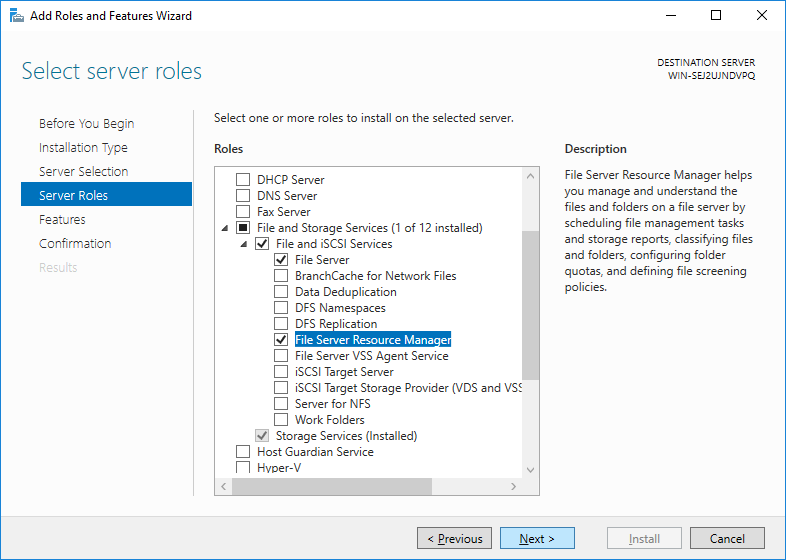 When you select "Domain Controller", you need to specify DNS name, NetBIOS name, or IP Address of the domain controller in the "Computer name" field. Leave the field blank to use the domain controller of the domain of the current user of HTTP Commander. When you select "XML file", you need to specify the path to the Drives.xml file containing all required settings. Note, the path is interpreted on the Web Server, not on the client that runs the web browser. where domain controller — is a DNS name, a NetBIOS name or an IP address of the domain controller. There may be a number of Drives.xml files on the domain controller, one for each GPO. The import utility loads all folders from the domain controller or XML file and matches them against the list of folders configured in HTTP Commander. Existing folders are updated, new folders are added. Folders are considered equal if they have identical names and paths. Comparison is case-insensitive. There are two options how Drive Maps target conditions are converted to folder permissions in HTTP Commander. If you select the option "filter" in the import utility, target conditions are converted to a filter expression and assigned to the filter property of the folder. If you select the option "permission" in the import utility, ACL of the folder is updated and the filter property is cleared. 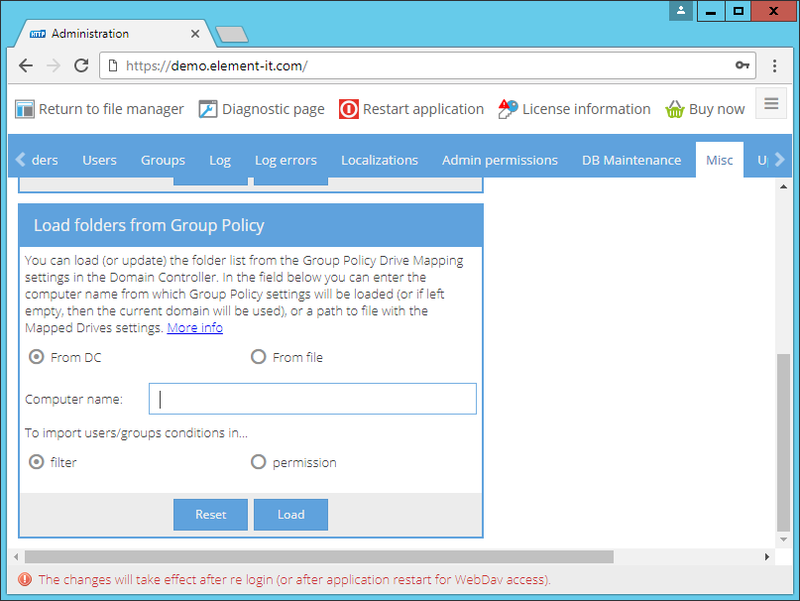 Users and groups missing in the Drive Maps target conditions are removed from the list, and new users and groups are added to ACL with default permissions. In addition to manual importing of folders, you can automate this task with the gpoldrives.exe utility. gpoldrives.exe, ElementIT.Common.dll, GpolManagement.dll, HttpCommander.dll, Chessar.LongPaths.dll, Newtonsoft.Json.dll. where '-p' - a flag for copying user/groups conditions to the folder permissions list. On this tab, you can manage (edit, delete) public links to files and folders created by users. You can also add new public links. You can specify which users/groups are allowed to manage settings, folders, accounts, localizations, view event logs, errors, diagnostics. Also on this tab, you can add folders and specify them for users/groups who will be able to administer. On the Admin panel, you can open the Diagnostics page (click the Diagnostics button in the toolbar) or view license type (click the License information button on the toolbar). The MailSettings group on the Settings tab in Admin Panel allows you to specify the settings of the SMTP server. These settings are used to send e-mails by HTTP Commander. E-mails are sent by recover user password and send e-mail features. Users may send e-mails to share links to files and folders. DefaultCredentials Specifies whether the default user credentials should be used to access the SMTP mail server for SMTP transactions. From From address of e-mails. All e-mails send by HTTP Commander have the same source address. Host Specifies the hostname of the SMTP mail server to send e-mails. UserName Specifies the user name to use for authentication to the SMTP mail server. Note. DefaultCredentials must be false to use custom credentials. Password Specifies the password to use for authentication to the SMTP mail server. EnableSsl Specifies whether SSL is used to access an SMTP mail server. MailSettings group represents mailSettings Element of .Net configuration. See MSDN for comprehensive description of parameters. Note. You need to assign modify permission to the application pool identity for the web.config file as specified in NTFS permissions section, otherwise HTTP Commander is not able to save your modifications.